Elba writes: I have a question. Does iCloud automatically back up to the last date it was backed up or does it give you the option of choosing a backup date? The reason I ask is because I deleted a contact on my iPhone, and was hoping iCloud would allows me to choose a backup date before I deleted that contact. Hi Elba! Good news: Yes indeed, you can restore an earlier iCloud backup than the most recent one. Keep in mind, though, that you can’t just pluck a single contact out of an older iCloud backup. Instead, you’ll have to restore the entire iCloud backup to your iPhone—meaning you’ll lose and calendar events, text messages, or other data saved to your iPhone after the date of the older backup. Whether you really want to go to all that trouble to retrieve a single lost contact is, of course, up to you. 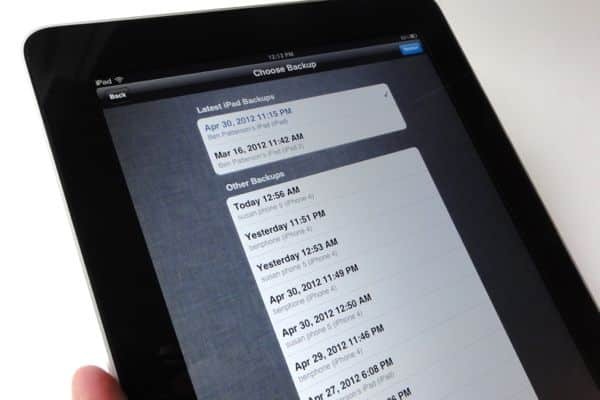 First, check out this article on how to restore an iCloud backup to an iPad—and yes, the process is the same on the iPhone or iPod Touch as it is on an iPad. Once you tap the blue “Restore” button, the iCloud backup restoration process will begin—and remember, it could take several hours, depending on how many apps, photos, music, and other media you had loaded on your iPhone. For more details, be sure to read this entire iCloud backup how-to. Hope that helps, Elba—good luck! Do you back up your PC or Mac on a regular basis? If you’re using iCloud to sync contacts, calendar events, and photos from your iPhone or iPad to your PC or Mac, you could always just retrieve a deleted contact from a system backup. Learn how to back up your Windows PC here, or how to back up your Mac with Apple’s Time Machine utility.